One of these balance exercises—walking, tai chi or yoga—may be the key to increasing your mobility. More than two million Americans participate in individual or group tai chi sessions each year, according to the National Health Interview Survey. Mobility is the ability to move around in the environment in which you live with ease and without restriction. The most obvious measure of mobility is walking. Walking with ease and without restriction requires a combination of strength, flexibility, and balance. Add endurance to the list if you walk for long enough periods of time. When you put it all together, walking is considered one of the best balance exercises. A 2011 study published in the Journal of the American Medical Association found that gait speed—how fast (or slow) a person walks—appears to be as reliable a predictor of longevity as factors such as age and gender. A study in the March 2013 issue of Stroke showed that 30-minute walks three times a week increased mobility and quality of life in stroke survivors. Incidentally, men 65 and older constitute the largest group of regular walkers. A widely recommended walking program for beginners has been published by the National Heart, Lung, and Blood Institute (NHLBI). This program will guide you from 0 to 40 minutes per day in 12 weeks (see Box 2-47, “NHLBI sample walking program”). 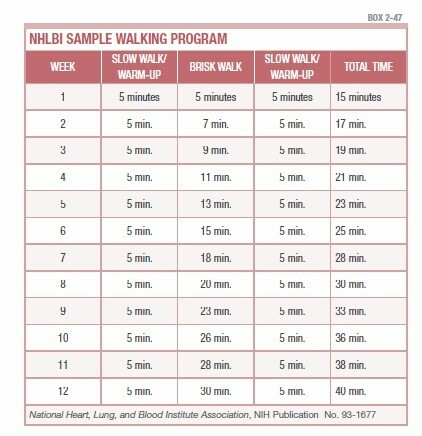 The National Institute of Diabetes and Digestive and Kidney Diseases (NIDDK) publishes a sample walking program that will get you from 0 to 60 (minutes per day) in 20 weeks (see Box 2-48, “NIDDK sample walking program”). More than two million Americans participate in individual or group tai chi sessions each year, according to the National Health Interview Survey. An increasing number of studies has affirmed that tai chi is a form of exercise that can improve balance, overcome a fear of falling, lower the risk of falls, reduce blood pressure, and provide a general sense of well-being. It is especially effective in older adults because tai chi can be practiced at different intensity levels. The number of movements in tai chi ranges from 18 to more than 100. Beginners start with as little as one five-minute session per week and gradually increase to a higher target goal. Finding a qualified instructor can be a challenge because certification of instructors has not been standardized, but your local YMCA and/or senior center may offer classes. Three of the most recent studies specifically found that: 1) tai chi exercises were more effective in preventing falls than a conventional physical therapy program, 2) tai chi classes were associated with a lower rate of falling in community-dwelling older adults, and 3) tai chi exercise may reduce falls in adult stroke survivors. Yoga also incorporates movement with meditation, relaxation, and controlled breathing. It has been called “an ancient method of stilling the mind.” For some, yoga is a spiritual experience; for others, it is an alternative activity that promotes flexibility, strength, and endurance. The evidence to support those claims is increasing, but not conclusive. A pilot study of 47 participants showed that stroke patients who participated in a yoga program demonstrated improved balance and flexibility, a stronger and faster gait, and increased strength and flexibility. For more balance exercises, purchase Easy Exercises for Balance and Mobility from www.UniversityHealthNews.com. add, blood pressure, chest pain, diabetes, digestive, dizziness, endurance, exercise, health, improve balance, meditation, mobility, osteoporosis, pain, reduce blood pressure, shortness of breath, strength, stroke.